We were on our way back from the library (I know, another exciting night lol) when I realized I had no artwork ready for the blog! So Hub and I went leaf hunting, and found this beauty in a church parking lot. This one may have been left over from last year, but I love the shape of it. The colors are definitely a challenge to my mixing skills, but I did this one with my full M. Graham palette and a roughly 5 x 7″ piece of Arches 140 # cold-press paper. It was fun, but I look forward to honing my skills and enjoying the deepening colors as this challenge continues! I wish everyone a peaceful Tuesday. Loving the crisper air and the light rain……makes for a wonderful painting and quilting vibe. Happy puddles of all sorts to you today! What a wonderful image, hunting for leaves in a parking lot for the sake of art…Love the commitment and love the artwork. Your leaves are as beautiful as their inspirations, so realistic…fantastic. Thank you, and I will look forward to seeing those! Have a great week! Thank you, Kerfe! I agree, the library is the best place ever (and has been for me, since I was very, very small). I was glad to see your Mets were on form last night. Well, they are playing Atlanta…on the other hand, they couldn’t beat Miami. A sweep would be nice. And go O’s! LOL 🙂 I hope the Mets ROLL and I bet if they go to the World Series, they will be playing KC. I hope they have better luck against them than we did in the ALCS last year. Evan, I got the idea from another art blogger, BB at BB’s Art and Design. If you go back to my first link, I’ve put a link to her summary of leaves from last fall. She is quite an inspiration! Thanks for your encouragement and I’m glad you’re enjoying the leaves! This is really very good….! Thank you so much, Nexi! Thank you, Charlie! I’m so glad you are enjoying my leaf series. You are so so funny. I love your blog! Yes, sir it does!!! ❤ Thanks again, Charlie! 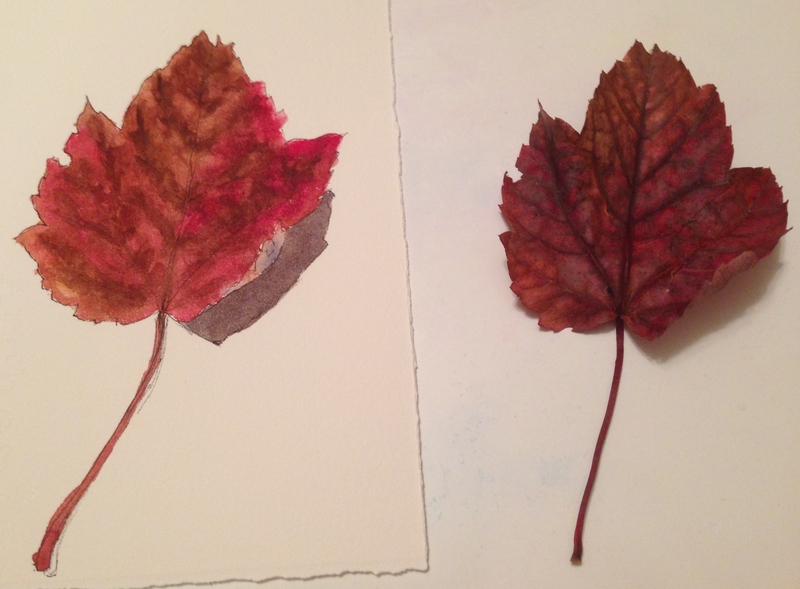 Hunting for the perfect leaf to paint is a worthy activity! 😄🌿 I love how you have captured the subtle colors in your lovely leaf study. Now, time to search for more leaves! Enjoy the day. Thank you, Sharon! I may carry this challenge on, as our foliage seems late to arrive this year! That’s ok, gives me more practice. Really enjoying this challenge. I hope you start to get a bit cooler weather soon! Yes, good idea, painting foliage is good practice. Of course weather is all relative. It’s in the 90s now and it’s much cooler! LOL! I did some the other day too. I picked up one leaf and did it pretty close to what it actually looked like, then decided to continue on for three more changing it up as I saw fit with different colors and just loosening up. 🙂 Will probably post in a few days or so. Yay, looking forward to them! Would be cool to do abstract leaves. Ooh. Wow. Ok that’s a great thought! That would be very cool! You are very organized and have posts ready way ahead. Me, not so much lol. sometimes I have some ahead, but this is not ready, just the painting – LOL! A stunning rendition! LOL about the library. What books did you read/take out? I am joining you in leaves today too on my blog. I had to take a leave of absence from the leaves (pun intended) to work on my seed cataloging in my journal. I think I have one more page of seeds to do … just one more. Peace be with you, sister! And also with you, my talented friend. Looking forward to your leaves! I have tons of library books all the time. These couple are quilting related. Not sure of the titles right off, I have quite a library book inventory here lol!! Thanks, Snehal! I painted this one properly, at a table and on good paper with artist-quality paint. It took about a half hour all told, so … I could have spent longer with it, but when I fuss over it, sometimes that just kills the whole thing. I’ve learned the faster, the better. At least, for me, at this point (and at my skill level). I’m glad you enjoyed this! I really admire your skill with watercolor, as you know! Thanks, Snehal. I really feel like a newbie with WC – so much harder to learn. I do enjoy it, though! You are capturing the leaves so nicely with color and texture. I thought about you over the weekend our leaves are starting to turn! Awesome, Carmel! I’m going to collect some of the real beauties and put them in the “House of Leaves”, as you suggested. Glad you like this one! That’s really good and great taht you went leaf hunting. I may have said this before but it bears repeating that I think you make the leaves even more beautiful than M0ther Nature made them! You’re too kind, Teresa! And thank you so much for saying so! I really appreciate your encouragement. I may just take this challenge even longer than 30 days! I know exactly what you mean, Teresa, because I am the same way. If I have something good to say, I won’t keep quiet – I have to let the person know how cool it is! I appreciate that you feel my work is worth a comment! It means a lot. I still feel like a total newbie at WC. I’m a bit more confident drawing at this stage lol (but only a bit)! Lol, thanks Jill! 😀 I’m really enjoying these leaves! I love how well you are able to paint the curls, texture and complex shading of colors. 😀 I’m on layer two drying on the kumquat leaf now. Reading blogs and catching up on email s while #1Grandson naps, and paint dries. Probably won’t get to finish it today. I don’t see your errors, but follow your train of thought ‘re: your challenges and triumphs avidly. I learn more than you can imagine reading your posts. Wow, really, Deborah? I’m so happy to hear that. I’m going on over a year of art nearly every day, not to mention endless books, youtubes, dvds, and I still feel like I know almost nothing. I can see why people become lifelong art students! I’m glad that something I’m doing is helping someone else get along a bit easier. There is tons of help on the art blogs. I learn so much from the other artists, too. You have perfected the art of leaves Laura. Leaf hunting is SO much fun! We have a nearby park that has the most wonderful collection of leaves, too many leaves are the “perfect” leaf. It is a challenge alone to pick which one to paint. Lovely mixing of colors! The rich colors are such a delight to try and recreate and be challenged with. It is a great challenge, I agree, BB! And thank you again for the idea! I’m dying to see what you’ll dream up for winter! Thank you! I sometimes feel I’m not really capturing the curve of the leaf at all, but I’m really glad so many people are loving these paintings! Makes me feel like a rock star, lol. To those of us that can’t paint you are a rock star!! Haha, good point, but last September, I couldn’t paint either! Or draw, for that matter. Thank you so much for the encouragement!! I actually own that book…the trick is figuring out if I still have it or if I sold it in the garage sale! I’ve made this journey before…I really have a great desire to draw…but I didn’t put in a lot of effort. Your idea of drawing everyday is something I need to sink my teeth into. Anything we try takes practice right? I’m tempted to say if it doesn’t come easy I must not be skilled at it. Thanks for helping me see differently 🙂 I will keep you informed on my progress…or at least I’ll let you know if I find the book!! haha, awesome! I was the same way. No one expects to sit down at a piano and play a symphony, so why should we figure we can draw a tree if we’ve not practiced? I did the same thing, all my life, so I know where you’re coming from totally. I always thought I didn’t have “the gift”….well, even gifted artists and musicians practice! All true! Now to find that book!!! Thank you, Ann! Yes I am so glad fall is finally here. The most beautiful time of year!